1 Piece per person with a maximum weight of 30lbs / 13.5 Kgs. Soft (all sides) luggage / duffel bags – with no rigid sides. Avoid luggage with wheels if possible. 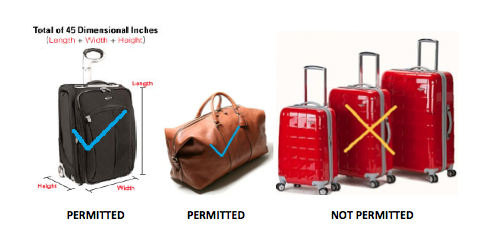 Maximum luggage weight is 15 kg (33pounds) including all carry-on luggage. A lady’s handbag or purse and a reasonable amount of reading material for the flight. A laptop computer or an I-pad. A small camera, binoculars, I-pod, Kindle or similar. The carriage of excess baggage is at the sole discretion of the Company after taking into consideration the aircraft being used and the number of passengers booked. When excess baggage is carried it will be charged at the prevailing rate. Excess luggage is charged at USD $03 per kilogram.